At the best Japanese and sushi restaurants—places like Takashi, Dojo, Naked Fish, Ichiban Sushi and Park City’s Shabu and Yuki Arashi, for example—you’ll find excellent sake selections to accompany their excellent Asian cuisine. In Japan, sake, beer and tea are the most common accompaniments to a meal; not too many diners are drinking Chardonnay. But what is sake, anyway? Do you know what you’re buying when you order sake in a restaurant? Maybe this sake primer will help. Knowing the basics about sake can help you to embark on your own path of sake discovery. The best way to learn about sake is to simply jump in and try some. Essentially, sake is made from water, yeast and rice. But, much as with wine- and beer-making, it’s the technical skill of a sake brewer (called a toji), along with variations in weather and what the French called terroir that distinguishes one sake from another. To make sake, white rice is washed and steamed, then yeast and a unique mold called koji is added, after which the sake is allowed to ferment. Sake fermentation generally takes about a month, then the sake is pressed to separate unfermented solids from the clear sake, filtered, pasteurized, aged (usually for six months), blended with pure water (to reduce the alcohol level) and bottled. As with grapes for making wine, there is a large variety of rice types used to make sake—around 65 of them. That variety produces flavor differences from one bottle of sake to the next. But, unlike with wine, the differences are extremely subtle. To explore those differences, it’s best usually to drink sake slightly chilled, not cold. Like with wine, the flavor profiles of sake emerge when it’s chilled a bit—about the same temperature or slightly warmer than you’d drink white wine. But serve sake too cold (as many restaurants do) and, as with wine, those subtle sake flavors will be lost. 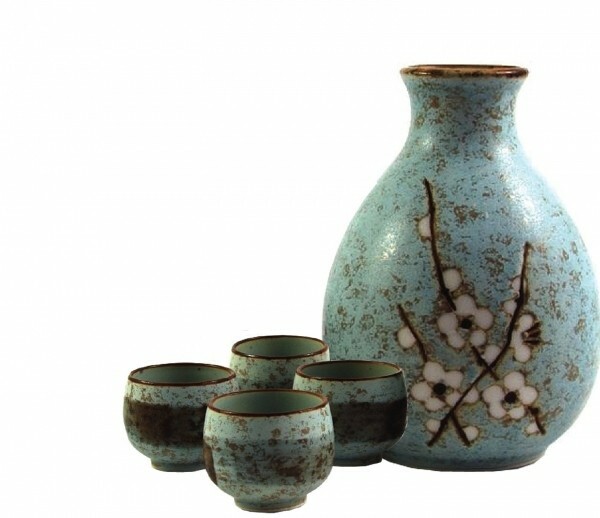 It’s commonly thought that inferior sake is served warm and premium sake is served cold. Well, it’s not quite that simple. Until recent decades, most sake in Japan was served warm. But that’s primarily because, due to the use of cedar brewing tanks, sake had a harsher flavor than it does today; warming the sake diffused the cedar flavors. So, ultimately, whether to drink sake chilled or warm is really a matter of personal taste—one that comes with experience and experimentation. It is true however that if you’re drinking cheap, inferior sake, you’ll probably want to warm it up a little to hide its flaws. Because of sake’s delicate flavor profile, it’s best drunk with foods that are similarly restrained. That’s why sake is such a natural partner for sushi and sashimi, where the flavors are generally subtle, not strong. Bolder flavors will tend to overpower most sake. And when drinking sake with dinner, don’t treat it like you’re consuming wine. Since sake generally runs around 17 percent alcohol, you’ll want to sip it slowly, in small quantities. Sake has been made in Japan for more than 1,000 years, and there are currently about 1,700 different brands. With most companies making a variety of types or grades, Japan produces somewhere around 10,000 different sakes. So, where do you begin? I suggest visiting your favorite Japanese restaurant and talking to a chef, server or manager; ask for recommendations. At a restaurant such as Shabu, you can immerse yourself in sakes ranging from Zipang sparkling sake for $10, to top-flight Takatenjin Shrine of the Village sake, which will set you back $110!